The social media handles of Delhi's ruling Aam Aadmi Party (AAP), including the Twitter account of of Chief Minister Arvind Kejriwal, went into overdrive on Friday to celebrate the visit to a mohalla clinic by an international delegation, whose members included former UN secretary-general Ban Ki-moon. Ban and Gro Harlem Brundtland, former prime minister of Norway, visited the Peeragarhi mohalla clinic and a polyclinic in Paschim Vihar. The duo were visiting the sites as part of their work for The Elders, an international NGO consisting of senior statesmen and human rights activists working to promote peace, justice and human rights across the world. 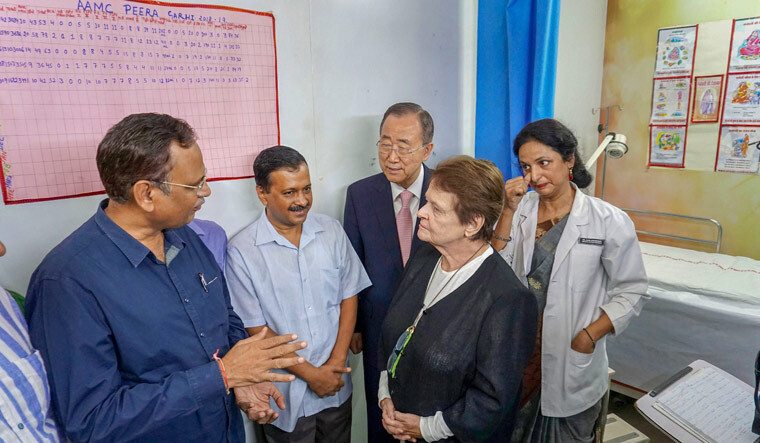 Referring to their visit to the mohalla clinic, Ban said, “I am deeply impressed by what I have seen.” Ban was accompanied by Kejriwal and Delhi Health Minister Satyendar Jain, a senior leader of the AAP. Brundtland called for replicating the mohalla clinic model across the country. Brundtland, a medical doctor, had also served as director-general of the World Health Organisation (WHO). From promoting the visit of Ban and Brundtland early on Friday, AAP's official Twitter handle posted multiple videos and photographs of The Elders' visit. This included photographs of Kejriwal and other AAP leaders having dinner with the delegation members on Thursday. A video of a Delhi resident thanking Kejriwal in the presence of Ban and Brundtland for “quality health services” at the government-run clinics was shared by AAP. Kejriwal tweeted that the endorsement from Ban and Brundtland was a “proud moment for India”. The mohalla clinics have been a key part of the experiment by AAP to revitalise Delhi's civic services for the benefit of lower-income groups, along with the Kejriwal government's emphasis on modernising state-run schools. In January 2017, The Elders had appreciated the work of the AAP's mohalla clinics with Ban's predecessor, Kofi Annan, writing a letter to Kejriwal.